One point three inches. How much difference can it make? That depends on what you're measuring. 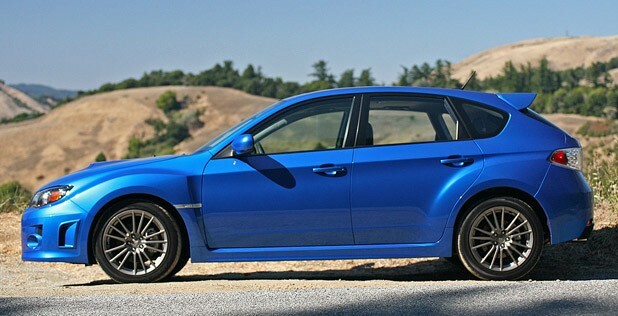 If you're comparing the 2010 Subaru Impreza WRX to the 2011, that small measurement makes all the difference in the world. If you're a Subie fan, you've already read our First Drive. 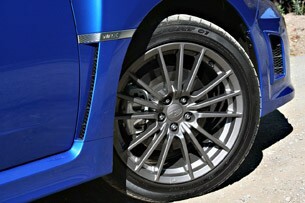 The headline news for the 2010-to-2011 changeover is that the WRX gained the STI model's widebody fenders and 1.3-inch wider track. Wanting to know whether the growth in girth made any difference to the affable and relatively affordable WRX, we decided to spend some quality time in the example you see here. We learned plenty. Many things work well for the practical enthusiast. Others, not so much. What works? The place we'll start is on a narrow, circuitous road outside of San Francisco that links two unimportant intersections well off the beaten path. Driving this road requires as much time looking out the door glass as the windshield. Some corners are cambered, which makes the flat ones much more interesting. 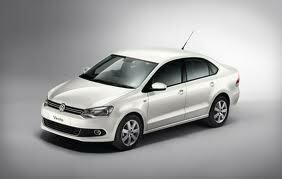 The straights are long enough to change up a gear, an action that is quickly followed by serious braking. Driven at just 25 to 65 mph, this road demands everything a car and driver can muster. We've enjoyed it many times and know that through many corners you'll use up every inch of the chassis's suspension travel. On downhill sections, brakes can fade. 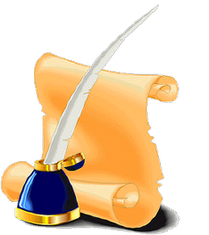 Communicative steering is highly valued because intel on the road surface can mean the difference between smacking a rock wall, driving into a ravine or clipping the perfect apex. 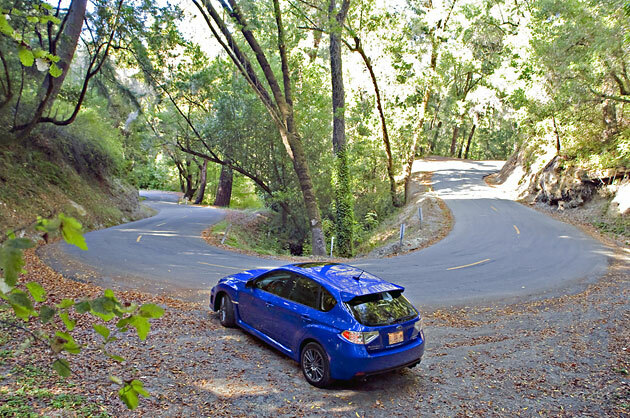 The 2011 WRX attacked this road. Spinning almost from lock to lock, Subi's light steering felt perfectly weighted for this duty cycle. Thankfully, the car's ample greenhouse and thin pillars provided good visibility. From the driver's seat, you don't notice the car's extra width. 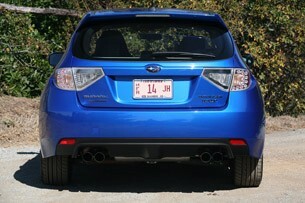 What you do notice is that when pushed hard, the WRX's jounce bumpers (a.k.a. 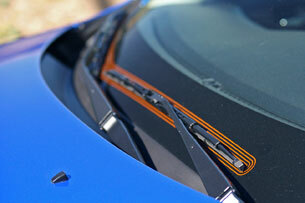 bump stops) are definitely designed to be an active part of the car's suspension. Jounce bumpers prevent articulating suspension components from impacting the subframe or chassis. In some cars, these are simply hard pads that prevent metal-to-metal crashes. 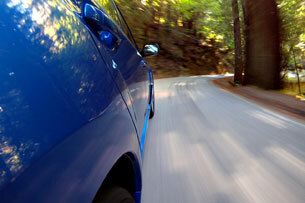 In the Subaru, they are progressively tuned to manage suspension energy during the last iota of suspension travel. 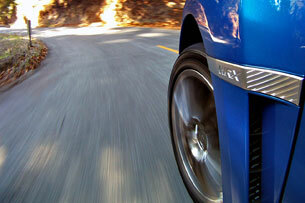 Braking and turning into a tight curve often uses up most of the damper's main travel. When steering corrections are needed or pavement undulations are hit mid-corner, the outside suspension components need to compress further. Instead of causing a harsh impact and a poorly controlled rebounding action, the WRX's bump stops absorb the extra energy and enable a smooth rebound that doesn't upset the neutral balance of the car, making the 2011 'Rex incredibly trustworthy and predictable at the limits. 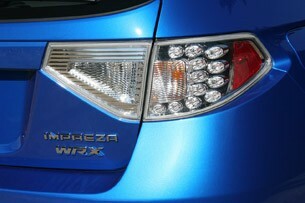 Once into a good road rhythm, you begin to notice other things about the 2011 Subaru WRX. The 265-horsepower turbocharged 2.5-liter flat-four sounds great. 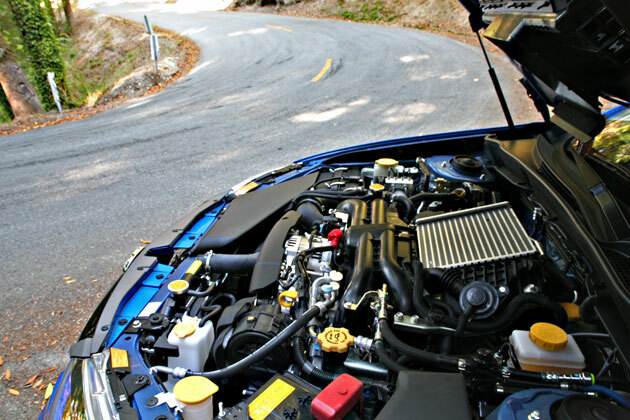 Unlike most cars, the WRX (and most Subarus) emits a unique exhaust note thrum that enthusiasts can ID without a pause in conversation, and the engine itself emits a muscular howl as it moves up and down the power band. On the highway, things settle into a pleasant hum that matches the powertrain's minor vibrations. But make no mistake – this is not a quiet car from idle on up, though if you're looking for interior refinement, chances are you aren't shopping for a WRX. As for how it performs, under 2,500 rpm the torque curve is flat (read: turbo lag). 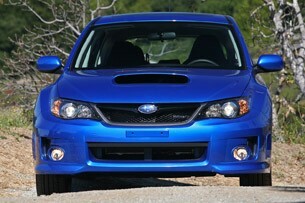 But spool it up and the 244 lb-ft moves the WRX with authority. On boost, the power delivery is nearly linear with a bit of extra ramp up just before the soft rev limiter cuts in at around 6,500 rpm. Like the steering, the clutch and accelerator pedals have a lightness to them. We would have appreciated more feedback from the clutch pedal, but it's easy to get used to and won't tire you out in normal driving. The shifter also felt light, requiring little effort to change from gear, while still providing Subaru's patented blend of aggressive notchiness. 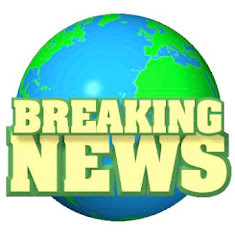 The relationship of the brake and accelerator pedal made heal-toe downshifting a breeze, even for someone with smaller feet. The brakes proved stout, but our pace was aggressive enough that the pedal did soften a couple times. The aroma of hot pads wafted into the cabin more than once, suggesting a pad and fluid swap before heading to the track. 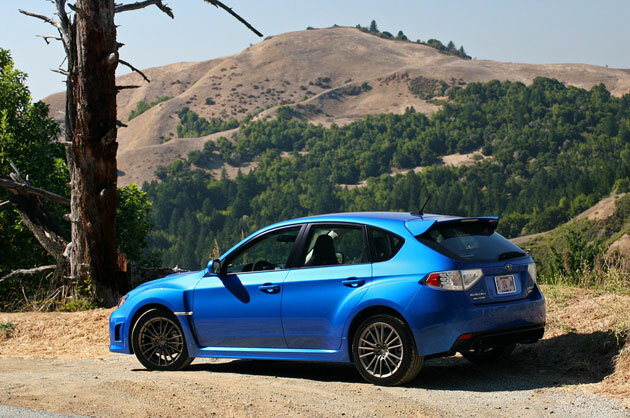 At legal speeds driving north on Highway 1 and then on interstates heading toward wine country, the WRX shared more about itself that only extended wheel time reveals. For example, the light steering that was a clear benefit on twisty roads felt almost too feathery for regular driving. Likewise, the useful suspension compliance sometimes felt floaty over undulating highway pavement. The front chair that proved initially supportive also got downright hard after five hours at the helm. Design details also made themselves known; the halo glow at the end of the speedo and tach needles made it easier to capture a quick read of those gauges. And those gauges are a style statement. Before you key the ignition, the dials are a black void. Once running, the gauges come to life and their graphics make them easy to read. Even still, don't confuse the WRX's interior for anything but a workmanlike environment – the controls are where you want them, but the overall ambiance is one of a discount and somewhat dated interior livened by a few good driver's tools (namely the wheel, alloy pedals and the leather gearshift knob). Wind noise was well controlled, and the cabin remained free of buffeting with the sunroof open. There was noticeable road noise, but considering the WRX is an Impreza at its core, expecting a library would be unreasonable. Curiously, most of the din seemed to originate from behind the driver. When the sun set, we quickly learned that the fog lights are for style only. Good thing the low beams threw adequate light and that functional fogs would be an inexpensive upgrade. Naturally, the optional HIDs are a solid investment considering how easy it is to overdrive the lights in a car this quick. 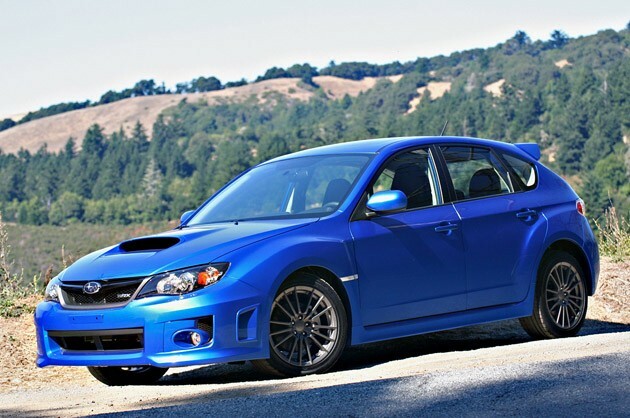 After spending quality time with the 2011 Subaru Impreza WRX, we came away feeling that this would be an easy, practical performance car to live with. In most people's real lives – as opposed to their fantasies – 265 horsepower is plenty, making the WRX STI's extra 40 hp seem superfluous. 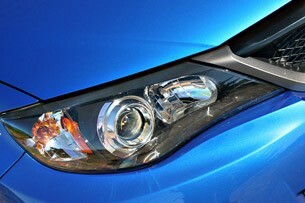 And about those extra 1.3-inches; they add considerably to the car's visual presence while enhancing usable performance. With a starting price of $25,495, that's a good deal no matter how you measure it.